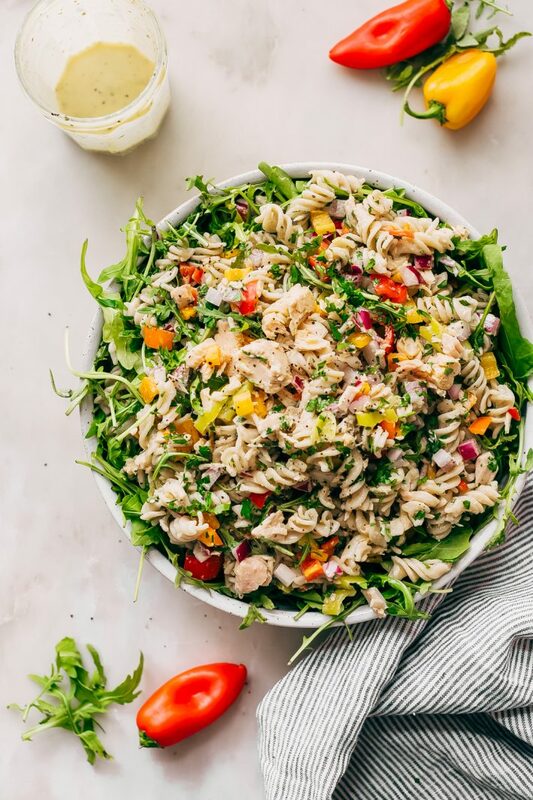 Learn how to make a quick summer tuna pasta salad that comes together in a flash! Loaded with tons of tender, peppery arugula, flaky tuna, and zesty pepperoncini. Dress it with the most addicting lemon ranch dressing. This is sure to become a go-to summer lunch recipe! Call it the end of summer salad or the beginning of the school year salad. 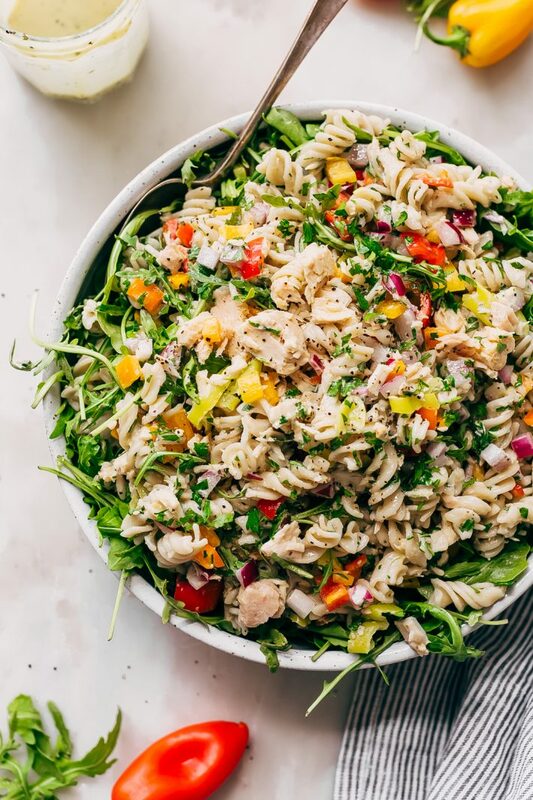 Regardless of the name, this is an easy tuna pasta salad that you can whip up without much effort. It’ll work well for lunch, dinner, and indeed hold for meal prep if you are into that sort of thing. For me, a salad needs to be a little more than just greens and dressing. I need color, crunch, carbs, and chopped herbs. Basically, the 4 ‘c’ that elevate our salad making game to a whole new level. What do I love most about this salad? The crazy, creamy, lemon ranch dressing that I sort of discovered on accident. I now use this on everything. It’s lemony, garlicky, and ranch all in one. You can drizzle it over a chicken, salmon, or shrimp. 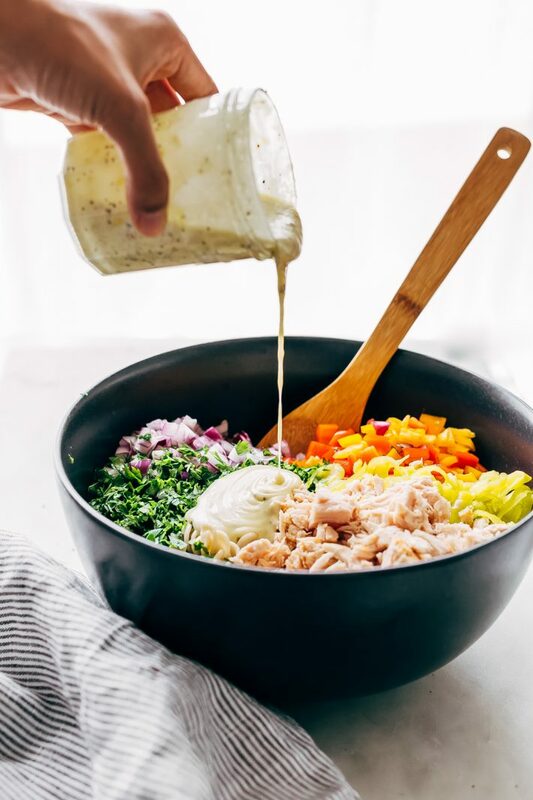 It’s a dressing that’ll treat you well regardless of your protein choice. Lunchtime around here means something that’s quick and hearty. I usually don’t have time to stop for midmorning snacks or in the afternoons so basically whatever I’m eating for lunch has to be filling enough to tide me over until dinner time. Too often we’ll have a batch of tuna pasta salad in the fridge. Take it from someone who isn’t the biggest fan of tuna; this is a good salad. We’re loading it up with veggies, chopped herbs, pasta, and a lemon ranch dressing. Before you know it, it’s got all sorts of Italian vibes with a hint of all American ranch. Something that sounds like it really wouldn’t work together. Except that it really, really does. I’ve shared a tuna orzo salad  with you in the past, which is mostly made with pantry staples. 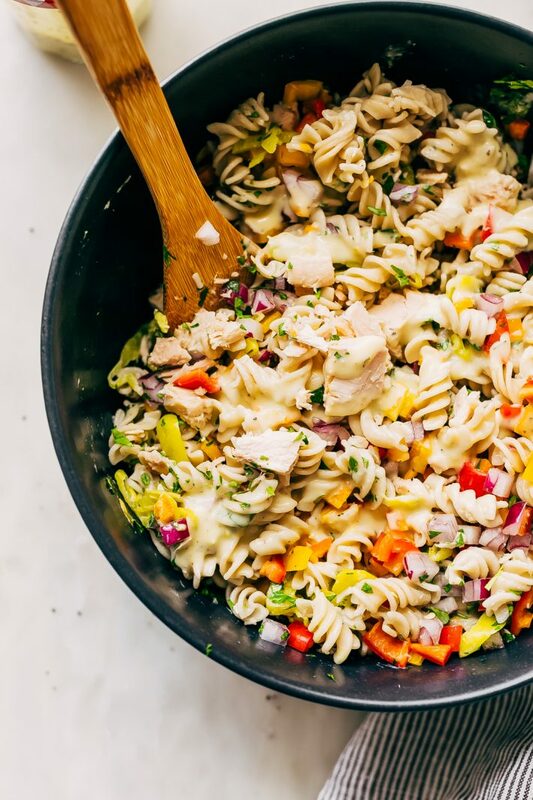 Today’s tuna pasta salad is just as easy to whip up, but it has the most addicting ingredients and flavor combinations. 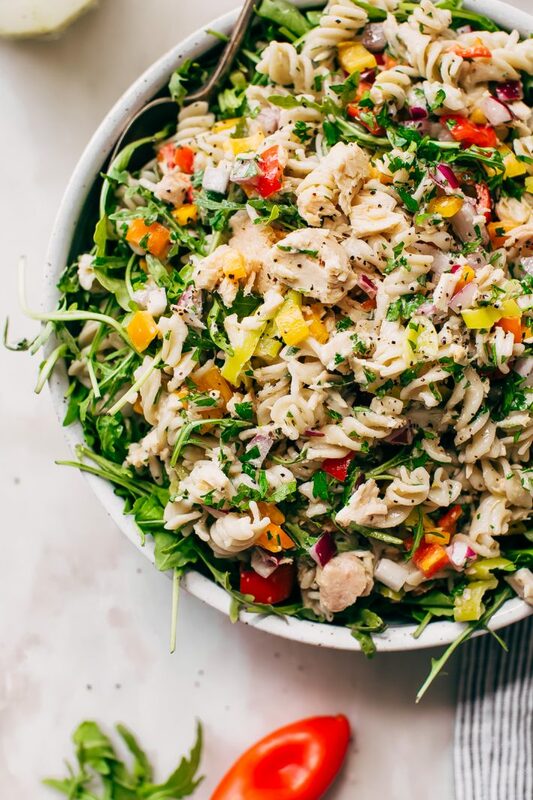 I make a lot of pasta salads here on the blog; like this Mediterranean pasta salad , sesame chicken pasta salad , California pasta salad , arugula pasta salad , Italian couscous salad , and the list goes on and on. But today’s tuna pasta salad is one that I keep coming back to again and again. It has simple ingredients that are always in the refrigerator or pantry even when I haven’t had time to grocery shop all week. That it. It may seem like just a few ingredients, but holy cannoli do they taste good when they come together! Now, about the pasta. You can use anything you like here. Rigatoni, penne, fusilli, orecchiette, macaroni, farfalle, cavatelli, Gemelli, I mean the sky is the limit. Trader Joe’s recently started selling a brown rice quinoa pasta that’s gluten-free. That’s what I’ve used here, it works beautifully. In the past, I’ve even made this with chickpea pasta, and you know what? I couldn’t even tell that’s what it was. Magnifico! When it comes to tuna, I prefer tuna packed in oil. Have you ever tried it? The flavor is very different than tuna packed in water. I find that it’s not as fishy, but maybe that’s just me. You can use either kind for this, no need to run out and buy more cans. Use what you have and what you like. TIP: You can also poach fresh tuna steaks for this. I recently caught something on a cooking channel where they poached tuna steaks in a garlic, parsley, onion, and peppercorn bath. Mind blown. I’m so doing that next time; that’s probably the only thing that’ll make this tuna pasta salad even better. Not a fan of tuna? Swap it with cooked chicken, salmon or shrimp! Simply put, this dressing is AWESOME. Add everything to a mason jar, give it a shake and there you go, it’s ready to pour on your salad. What I love is that you have most of this stuff on hand at all times. The lemon and ranch don’t sound like they’d work well together, except they do. Think about how well this would all come together with the peppery arugula, the zest pepperoncini, and the pasta! I prefer this pasta salad at room temperature or cold. But I’m also not a huge fan of warm salads. The arugula would wilt if you were to toss it with warm pasta so make sure you give the pasta ample time to cool down first. You can mix the dressing in all together or keep it separately. I generally keep the arugula separate and toss the dressing with the salad. 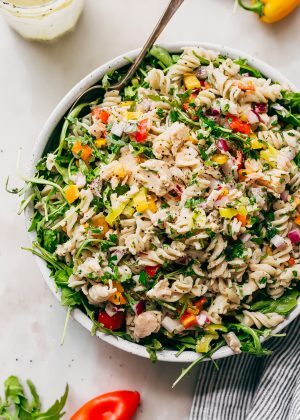 You could even put this into mason jars  (affiliate link) add the dressed tuna pasta salad to the bottom and top it with arugula, that way it’s ready to transport, and you don’t have to worry about carrying the greens separately. That reminds me, you could swap the arugula for something like baby spinach or even baby kale. This salad would work well for potlucks, book club gatherings, it’s ideal for meal prepping on Sunday to enjoy during the week, and it’s the perfect thing to toss together for friends or family if you’re feeling extra nice and want to drop off a meal for them. Lastly, this salad takes no time at all to put together. It’s about 10 minutes of work. The best part is you can start by putting on a big pot of water for your pasta to boil and by the time the pasta is cooked, you’ll be done prepping all the other ingredients. Be sure to let the pasta cool for a few minutes before you toss it in with the other components though. If you’re in a huge hurry, you can cool the pasta quickly by draining it and dumping it into a lightly salted ice bath. It’ll keep the pasta from losing its flavor while still cooling down rapidly. Then drain and toss it together with everything. The best part is, you don’t need anything else with this. You’ve got your greens, protein, and carbs all in one. Believe me; this tuna pasta salad is a powerhouse! It’ll keep you full all day long! Learn how to make a quick summer tuna pasta salad that comes together in a flash! Loaded with tons of tender, peppery arugula, flakey tuna, and zesty pepperoncini. Dress it with the most addicting lemon ranch dressing. This is sure to become a go-to summer lunch recipe! PASTA: prepare the pasta according to package directions. Drain and allow the pasta to cool. 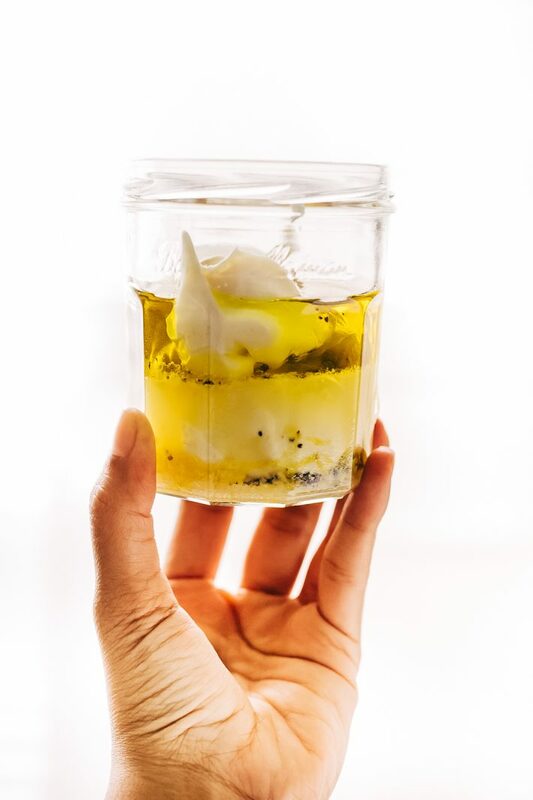 DRESSING: Add all the ingredients for the dressing in a mason jar, screw on the cap and shake until the ingredients are well combined. Start with 1 teaspoon of sugar, taste and adjust as desired with additional sugar, salt, and pepper. SALAD: Add all the ingredients for the salad in a large bowl if you plan on serving all of it right away. If not, I suggest combining everything but the arugula and tossing with the salad dressing. Add the arugula right before serving. leftover salad will last covered in an airtight container for up to 3-4 days. I like to keep the arugula separate and toss it in right before serving so that it’s crunchy and fresh! 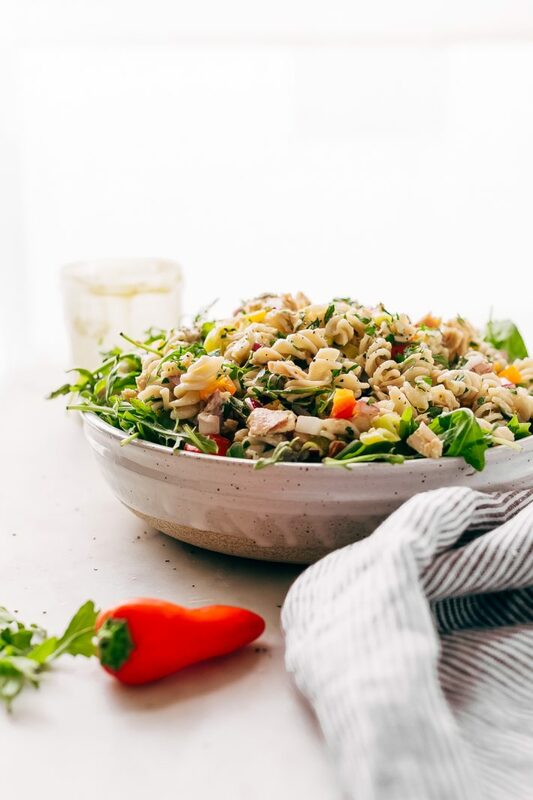 You can also pack the pasta salad in a mason jar and top it with the arugula that way it’s easy to transport and everything still stay fresh!